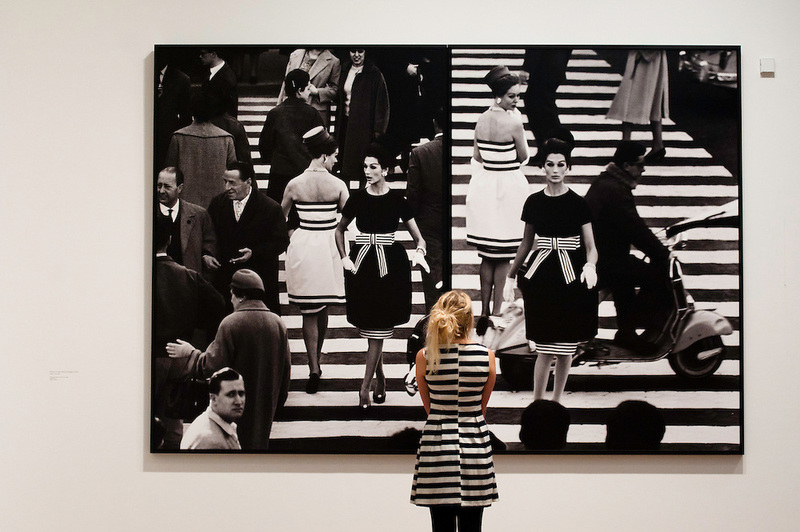 London, UK - 8 October 2012: a visitor looks up at 'Piazza di Spagna, Rome 1960' by William Klein. The exhibition examine the relationship between the work of William Klein (b.1928) and that of Daido Moriyama (b.1938). Taking as its central theme the cities of New York and Tokyo, the show explores both artists' celebrated depictions of modern urban life. tate tate modern tate gallery london uk photographer show contemporary art show expo exhibition daido moriyama william klein new york tokyo japanese press preview twentieth century artist provoke movement retrospective print sheet installation solo reportage photo reportage photo reporter features reportage photography reportage photographer documentary photographer documentary photography editorial reportage photographs photographs image images picture pictures photo photos project photoproject photo project photograph photographs event photographer event photography events photographer events photography event photographer london events photographer london press photographer london press photography london press photographer news photographer fotografo a milano fotografo milano fotografo milano centro fotografo lombardia fotografo "milan photographer" "photographer in milan" "photographer in bergamo""photographer milan" "photographer milano" "photographer in milano" "italian photographer" "photographer in italy" "photographer in lombardy" "fotografo a como" "fotografo a pavia" "fotografo a bergamo" "fotografo a trieste" "photographer trieste" "fotografo di milano" "fotografo a milano" "photojournalist in milan" "corporate photographer" "event photographer" "fotografo di eventi" "fotografo di eventi milano" "milan photographer" "photographer in milan" "photographer in bergamo" "photographer milan" "photographer milano" "photographer in milano" "italian photographer" "photographer in italy" "photographer in lombardy" "fotografo a como" "fotografo a pavia" "fotografo a bergamo" "fotografo a trieste" "photographer trieste" "fotografo di milano" "fotografo a milano" "photojournalist in milan" "corporate photographer" "event photographer" "fotografo di eventi" "fotografo di eventi milano" "photographer in bergamo" "photographer in trieste" "event photographer milan" "milan photographer"